The Friends of the Blue Hills Adopt-A-Trail program depends on dedicated volunteers to regularly maintain trails and report trail needs. Without regular volunteer support, many of the 125+ miles of trails in the Blue Hills Reservation will deteriorate and become unusable. The Adopt-A-Trail Program is designed to allow volunteers to take responsibility for regular trail maintenance on a trail or section of trail. We will provide training to all Adopters to ensure they are confident to perform their work in a safe and effective manner. The goal is to attract volunteers that walk a section of trail on a regular basis who are willing to perform basic maintenance to keep that trail in great shape. Basic maintenance of a trail includes cleaning drainage structures – like waterbars and culverts – of rocks, leaves and branches; removing branches that overhang the trail and downed branches and trees; and removing trash from the trail. We encourage Adopters to enjoy your work with friends and family, and take satisfaction from the fact that they are helping to protect the Reservation’s trails for current users as well as future generations. 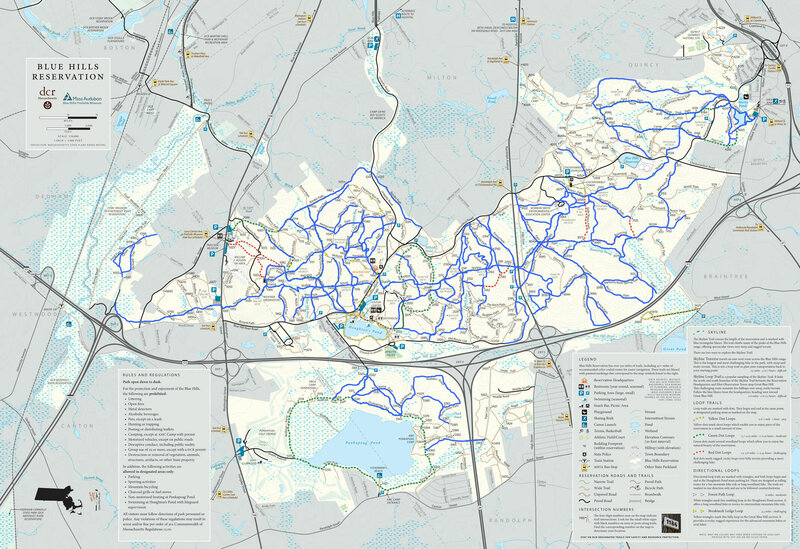 A map marking all trails currently adopted is displayed below on this page. For a list of current adopters and their adopted trails, click here. Submit an Adopt-A-Trail Application Form. Perform these necessary tasks a minimum of three times a year, depending upon the needs of the trail. Submit an online work report after each work visit to your trail. Work closely with the Program Leaders and maintain open lines of communication. Adhere to standards set forth in the FBH Adopter Handbook. Perform all work to protect the environment, natural resources, and the recreational experience of trail users. Act in the spirit of partnership and as an FBH ambassador to the hiking public. Make an initial trip as early as possible in spring to clean all drainages. Clear any overgrown brush of trail before the heavy hiking season begins. Make sure drainages are always clean, so as to prevent erosion and maintain the health of your trail. Communicate any need for help to FBH trail leaders.